What is Embroidery? Embroidery is the art which consists of decorating different materials such as fabric by using a needle and a thread. Usually many people are interested in embroidery as it is a beautiful work of art. However on the other side many people ask what is embroidery? Embroidery means only a needle or the art of needle work. These are the two definitions of embroidery but still there can be many other definitions as well. This art work require a lot of hard work and as you have to concentrate on your needle and the thread and if you lose concentration then your work will not result in as good as you thought it would. To learn how to do this artwork you need a bit of training and at first it can be difficult but afterwards when you get the hang of it you wont face any problem as this will become easy for you if you work hard in your training session. For those people who ask what is embroidery it can be difficult to explain it to them as they wont just understand it by the definition, they have to see it themselves the art and then they will get the complete idea about it. If you are interested in embroidery and if you want to be an expert in this art then you need to take this work as your hobby as all the other people do. Embroidery is getting very popular and it has been for decades. Nowadays technology has made it easy for all embroiders but still people want to do it with their own hands as they enjoy embroidery by hand. There are many different embroidery machines available now but people who live in villages cannot afford these as these can be expensive however this is not a problem from them as doing embroidery by hand is not such a big task for them as they have been doing it for years. 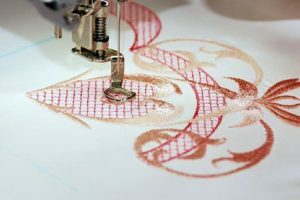 There are five different stitches that characterize embroidery. First of all there is the outline. This is the stitch that outlines the drawing on the fabric. Then there is the Satin, this is when the stitches are done very closely and there is no gap. Then there is the lazy daisy, this is normally used for flower petals. The fourth one is the Cross stitch and the fifth one is French stitch. French stitch is used to for small dots. Among all these different stitches the outline stitching is the easiest. Now that you now about embroidery if someone comes to you and asks you that what is embroidery then now you will easily be able to explain everything about embroidery to him. If you want to learn more about embroidery then you can go online and search about the details of embroidery and you can also visit many websites that actually show you how this art is done and you will also be able to see the different designs of embroidery. There are also magazines available that shows the new and latest designs of embroidery.